Announcement Welcome to TAGTOPIA! Please read our shop announcement for important info including current lead times! Our current business days are MONDAY-FRIDAY*******LIMITED REPLY SATURDAYS- CLOSED SUNDAYS! ***Until further notice we will only be shipping Monday-Friday--no longer making shipping drops for SATURDAY. QTY 1000+: 7-10 days depending on order...will be quoted after proof approval. **We are NO longer taking new international orders including Canada. We ship via USPS PRIORITY MAIL ONLY to ensure that if your item is lost or damaged by the USPS it is fully insured. If you wish to ship via regular first class mail please convo the shop and something can be arranged. Please read entire listing and shop policies before placing an order — also if you have questions most FAQs can be answered in these spots! TAGTOPIA prints thermally in BLACK ONLY! NO COLOR PRINTING! Welcome to TAGTOPIA! Please read our shop announcement for important info including current lead times! Ho Ho Ho from TAGTOPIA!! 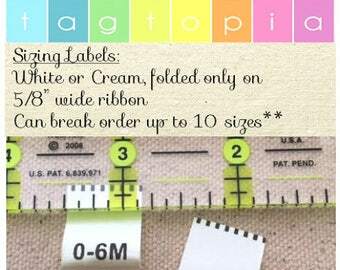 Flat sew around labels! Thanks Plush Pup! Pre-made Labels~ Ready to ship! I loved creating happy items that made people smile and continue to do so. Best part of being an ETSY seller is the kind and encouraging feedback from your buyers. Getting your first sale on ETSY and your first positive feedback comment on ETSY are two of the most rewarding feelings you will experience as a small business owner. It's awesome!! I am a one woman shop and take my customer's satisfaction very seriously. I am a first time mom of a spry and happy toddler boy who keeps me on my toes every minute....scratch that every SECOND of the day! My hours of operation are like a lot of mom-crafters here on ETSY....at naptime & after the little one goes to bed...for me specifically between 9pm-2am so I will be burning the midnight oil to make a fantastic product that will keep you coming back for more! 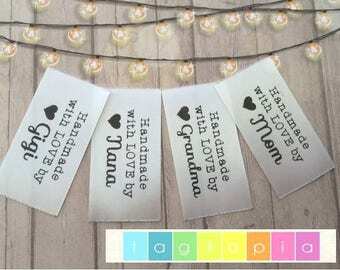 My new labor of love T A G T O P I A is just as exciting and promising~ creating personalized textile tags & ribbon for small businesses and for extra special events like weddings, baby showers, milestone birthdays, anniversaries, graduations etc etc etc!!! Happy Shopping !! The ETSY experience is like none you've ever had before! In a nutshell I am a wife, a mommy to my beautiful toddler son, an entrepreneur, a crazy crafter, a Halloween loving nut and overall kid a heart! I have loved to create things with my hands since I was a very little girl and still do! Hi! Please take a moment to read through our policies and happy ETSY shopping! I feel it's important for buyer and seller to understand all shop policies prior to placing orders! We are committed to providing outstanding product and service so please send us an email with any questions or concerns =) We communicate via ETSY mail ONLY to keep order details in one place...please do not request sending proofs to private email addresses. Overall our goal is to make sure you are super content with our product. If something is awry please convo us and give us the chance to correct things before leaving feedback. Refunds or reprints (once approved) will be completed once you return the labels (for inspection mainly) at buyers expense. An order can only be cancelled if it has not gone through the final printing process however will be subject to a 15% of listing cost fee fee for time spent on proofs. We accept PayPal, ETSY gift cards, & credit cards. If you require another payment option please convo me to discuss. If you pay with paypal e-check no work will be completed until the payment has cleared. Orders can only be cancelled if they have not been printed yet. We have the right to refuse service and will refund order in full should we decide that the order cannot be completed to our high qualitiy standard for whatever reason. We ship ALL domestic orders via USPS priority mail ONLY. All domestic orders will come with tracking info once shipped which will be emailed to your ETSY mail. Please also make sure that the address in your ETSY account is the correct shipping address for this info is pulled down into the ETSY shipping tool automatically. If you need it shipped to another address please advise or update with Etsy. Tagtopia cannot be responsible for lost shipments due to fault of the USPS and/or incorrect addresses given by the buyer. I DO NOT ship express so please do not request it! Q: Will I get a proof to approve prior to printing? A: YES! Your first 2 proofs are free of charge--- all proofs past the second are subject to $5 ea charge. I can normally get proofs out to you in 24-48hrs after order placement. I DO NOT work on proofs until an order is placed due to my workload. I WILL NOT go to final print without a written approval so please check back to Etsy mail after order placement to review your proofs. If an order sits for more than 30 days w/out an approval it will be fully refunded and the order cancelled. If you APPROVE a proof and there is an error I cannot be responsible for replacing your items! Please review your proofs closely for any spelling or text mistakes! Q: What is thermal printing and will my logo/arwork work with it?? A: We use high quality washable resin foils that use heat to transfer the image permanantly onto the tag. Thermal printing is also used in barcoding etc. It is very affordable and higher quantities can be produced much faster than other methods. This print technique only works well with clean, crisp black images and lettering. Dainty and whispy type fonts and logos will NOT print well with thermal printing. Message me for more info! Q: How do I re-order my labels? What if I have changes? Q: Can you give me multiple proofs to choose from? A: We offer 1-2 proofs per order due to tedious nature of proof building and to keep costs down. 3+ proofs subject to $5.00ea charge. Exceptions will only be made on a case by case scenario and we have the right to refuse multiple proofs. I have the right to charge extra for anything re-proofed numerous times. Please note that all proofs are printed on WHITE ribbon only and are to be used to confirm the correctness of the wording, placement and size of the label. If there are errors on proofs that were approved we cannot replace or refund your order. Q: Will the labels fray? A: Folded labels are 99% fray proof if sewn into seam properly. These are NOT pre-folded and will be shipped flat for best transit. They should be sewn in correctly to avoid fraying. We will not be responsible for fraying on items that are not sewn in correctly. A: We use a thermal heat technique for our printing process which is washable however like any garment will fade. High frequency HOT/WARM washing will cause this fading to accelerate (i.e. cloth diapers, high freq baby items etc). Due to our lack of control over washing techniques and chemicals used during wash we cannot be responsible for out of the ordinary fading. Normal fading will occur over time...this is inevitable. Please see more info above regarding this issue. CREAM RIBBON IS RECOMMENDED FOR LONGEST LIFE OF LABEL! Q: What if I’m seeing “runners” like in pantyhose? Q: Can my order be split up into diff styles? A: the short answer is no…we can only do one design per order. If there is a strange circumstance please convo me and we can discuss further. TAGTOPIA reserves the right to refuse service to anyone should we deem it necessary! We communicate via ETSY mail ONLY to keep order details in one place...please do not request sending proofs to private email addresses. Adding an email address or website as a way to contact you, is a good idea, but not mandatory.